Clarksville, TN – In 1986, communities across the state honored Tennessee’s cultural heritage during then-Governor Lamar Alexander’s yearlong Homecoming ’86 celebration. In Clarksville, officials at Austin Peay State University participated in the event by commissioning Dr. James Diehr, professor of ceramics and sculpture, to produce a piece for the University’s front lawn. 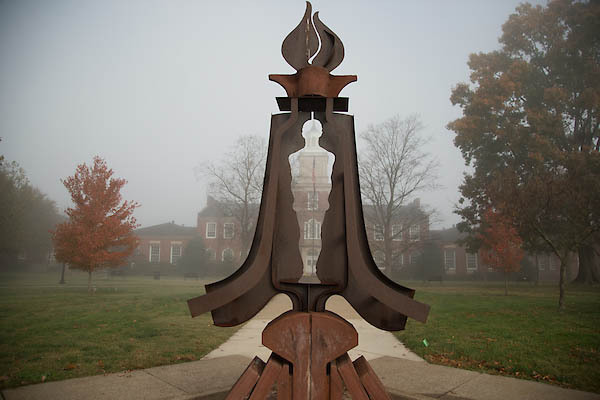 More than 30 years later, Diehr’s tin and concrete sculpture, “The Gateway,” remains an iconic part of the campus, but few people know its name or history. At 5:00pm on Thursday, November 1st, 2018 the retired APSU professor will return to the quadrangle in front of the Browning Building for the unveiling of a new plaque honoring his work. The event is free and open to the public, with a reception at 5:30pm in the Art + Design Building. During the reception, set to begin at 5:30pm, the Department of Art + Design will open a new display of Diehr’s work on the building’s Jim and Dottie Mann Wall of Legacy.